For everyday printing, the Brother AX120 offers a great combination of speed and reliability. Inevitably your Brother AX-120 will use all of it's ink and when it finally does happen you'll discover that brand new Brother AX-120 ink can be costly. You do not need to get stressed about shelling out the steep costs you'll find on the high street because here at Cartridge Save you can pick up all the Brother AX120 cartridges you'll need at seriously low prices. Save money on your ink by buying online at Cartridge Save! Don't overpay for the AX-120 original cartridge or AX-120 compatible ink down the main street when it is much easier to save some money shopping with Cartridge Save. Have one hundred per cent satisfaction when buying AX120 ink cartridges from us because they all are covered by a straight forward money back guarantee. Bear in mind the fact that every single purchase has free delivery, usually delivered to your doorstep the next business day! A reliable typewriter, the Brother AX-120 comes with auto correction tapes instead of wet correction media. The AX-120 ribbon printer uses cassette ribbons and cassette daisy wheels for typing. This typewriter is ideal for personal as well as office use. Electric typewriters like the Brother AX-120 are now rare, so it may be hard to find cassette ribbons, consumables, and parts. The slim and compact Brother AX-120 typewriter is lightweight and takes up very little space. It has platen knobs with release push buttons for adjusting the paper. The Brother AX-120 has a keyboard cover, grip handle, and a compartment for the plug. Print speed is 12 cps. The Brother AX120 can handle five copies at a time (four copies and one original). This machine runs on a Brother 1030 typewriter ribbon designed to print in black. Typewriters are very reliable and easy to use. 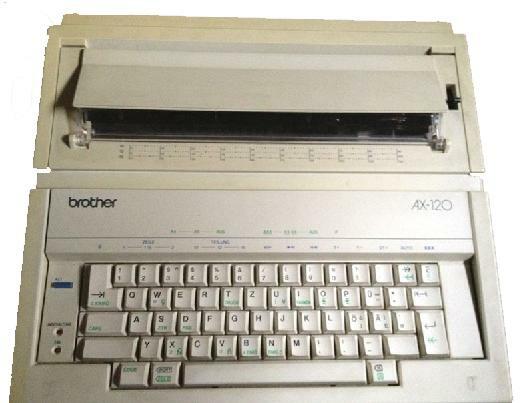 The Brother AX-120 electronic typewriter is no exception and even comes with an auto correct media tape. This way, users do not have to use third party correction. The Brother AX120 portable typewriter is lightweight and is very easy to bring along on business trips or take to school. To change font or typefaces, optional daisy wheels must be bought separately from the AX120 typewriter. Most typewriters are obsolete and it may be hard to find cassette ribbons and other products for the Brother AX-120.